Eric joined the Symphony Nova Scotia administrative team for the start of the 2009/10 season after thirteen years as Associate Principal Trombone of the Honolulu Symphony. He also served at various times in Hawai’i as Assistant Personnel Manager, Audition Coordinator, and Personnel Manager. 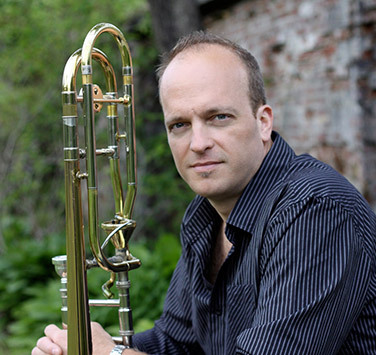 Eric has played trombone with a variety of ensembles, including the Charlottetown Festival Orchestra, the Royal Winnipeg Ballet Orchestra, the Millar Brass Ensemble, the Honolulu Brass Quintet, the Chicago Civic Orchestra, and the Chicago Symphony. He is an avid chamber musician and is a member of the Maritime Brass Quintet. Eric’s first professional symphony orchestra job was as Second Trombonist for Symphony Nova Scotia’s 10th Anniversary Tour. He now performs regularly with the orchestra and enjoys having an additional artistic outlet as a concert planner. Eric lives in Halifax with his wife, Andrea, and his Barbet puppy, Ollie. Why did you start working with Symphony Nova Scotia? I’d been wanting to return to the Maritimes for a long time, and felt that the impending bankruptcy of the Honolulu Symphony was probably a good time to make the move. Do you do any other work on the side? I play trombone whenever I can get someone to pay me to do it. I also love to teach trombone to children and adults of all ages. I get an incredible rush from being in the middle of such a huge sound that passes through so many extremes of dynamics and emotions. What’s the best/worst thing about being part of Symphony Nova Scotia? Do you ever wonder why third world countries place such a high value on music and the arts? Hiking, or anything else that allows me to exercise while enjoying the outdoors; enjoying good food with good people. The 2012/13 season’s Brahms’ Symphony no. 2 was one of the most enjoyable musical experiences of my career, bar none. I’ll also always have a soft spot for our performance of Mahler’s Second with Mr. Tintner in 1992. I played as a member of the Nova Scotia Youth Orchestra, and that experience made a huge impression on me! Who are your favourite music groups? Becoming a professional trombonist – I’ve met some incredible people over the years while performing some of history’s greatest works of art. It’s also allowed me to live in some of the world’s great paradises: Hawai’i, PEI, Chicago, Nova Scotia… It was also through music that I met my wife, Andrea. What’s your favourite movie/book/TV show of all time? Exercise. Hang out with Andrea and Ollie.